An effective regulatory and legal framework is indispensable for the proper and sustained growth of businesses. In a rapidly changing national and global business environment, it is necessary that regulation of corporate entities is in tune with the emerging economic trends keeping in mind the interests of the investors and other stakeholders. To keep the Indian legal framework in tune with this rapidly changing environment, several laws have been enacted or amended in the last decade. It is expected that this constant change in the regulatory environment will be conducive to the economic growth of the country. However, this growth is possible only if the stakeholders are properly sensitized and educated about the updated framework. The laws are implemented by several authorities who have the powers to impose fines, penalties and other civil and criminal sanctions. A failure to properly follow the regulatory framework may lead to such sanctions which may cause major harm to the business. Therefore, it is imperative to know the changes in the legal framework to operate a business successfully as the business must function within this framework. Advocacy can be used as a tool for educating and sensitizing the stakeholders about the changes in legal framework. The objective of advocacy is the engagement of stakeholders in relation to the laws affecting them. Thus, by engaging the stakeholders in an educative discourse, the harm to businesses can be controlled while simultaneously allowing the stakeholders the benefits of the changes. To ensure smooth execution of the advocacy program, it is desirable that there exists a single institution which oversees and implements them as the methodology and process for such Advocacy remains largely similar. In light of the fact that Indian Institute of Corporate Affairs (IICA) has a wide range of experience in conducting training programs for different statutes, it is therefore conceived that IICA acts be treated as a fulcrum for all the Advocacy needs. Mr. Santosh Parashar has 16 years’ experience both in academics and industry. His immediate past assignment was ASSOCHAM where he has last served as Additional Director & Head of Corporate Affairs and Capital Markets Division and Executive Secretary, PEVCAI. He has been associated with SEBI as certified resource person for its Investor Protection and Education Initiatives since yr. 2012. He is experienced in managing affairs of policy advocacy and establishing a bridge between stakeholders, regulators, government and its functionaries. 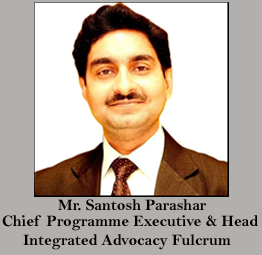 His role at Integrated Advocacy Fulcrum-IICA is to engage, educate and sensitize the stakeholders about the changes in legal framework, oversee and implement the policies & programmes which are of importance to the advocacy areas towards bringing greater effectiveness in Corporate Affairs.